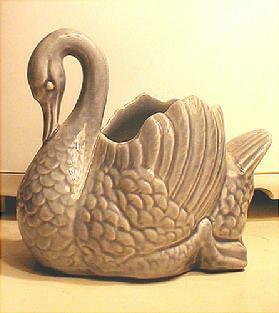 Red Wing Pottery production began in the mid 1860s. 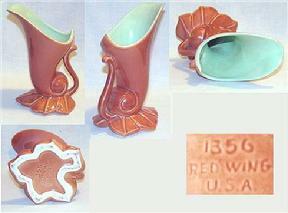 Skilled craftsmen-potters from Germany had settled in Red Wing, and using natural clay deposits, began producing pots. They produced ware for processing and storing food. They made crocks, jugs, and bowls, and other utilitarian items for use in the agrarian economy of the day. They produced salt glaze pottery, characterized by a clay body of grey or tan with a surface that felt like the surface of an orange (pocked), and decorated with a simple hand-done, cobalt blue decoration of a bird or flower. Red Wing was a grain town because of its location on the Mississippi River. As a result of the success of the grain industry, Red Wing was an ideal location for the pottery industry to grow. There was ready capital, a means of distribution with river barges and railroad, and skilled potters. These elements combined to cause Red Wing to have the largest pottery company in the United States in the early 1900s. The growth meant that they had to abandon the craftsman's way of production, where a skilled potter saw the piece through the whole production process. The Red Wing Potteries industrialized at the turn of the century and abandoned salt glazed pottery production in favor of a more uniform Bristol glaze ware. The production workers now worked in an assembly line and they began to use more machines and molds in the production of the pottery. 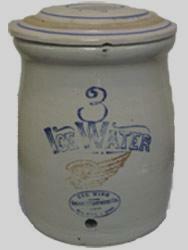 During this era they began applying the, now famous, red wing on the sides of the pottery they produced. The company continued to serve primarily an agrarian customer in the Midwest and Northwest United States and many areas of Canada. When our country returned from the world wars, our economy began to shift from being primarily agrarian to being more urban. The Red Wing Potteries shifted its focus in the line of products it offered from crocks, jugs, butter churns and water coolers to dinnerware, vases, statuary, and other items for the home. The company continued to thrive until foreign manufacturers, with cheaper labor, began to compete in the U.S. marketplace. The company shut down its large production factory in 1967. The business remained under the leadership of its president, R.A. Gillmer, primarily as a retail pottery salesroom. R.A.'s grandson, Scott Gillmer re-started the manufacturing in 1996. Red Wing Pottery continues today, and has found success by going back to its early skilled-craftsman roots. 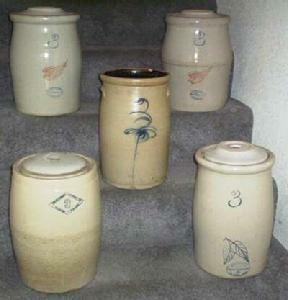 1865-67: German Immigrants that had settled in Red Wing began making pottery. 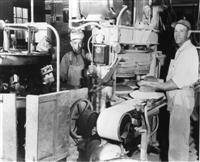 1878: Red Wing Stoneware Co. began. 1883: Minnesota Stoneware Co. began. 1892: North Star Stoneware Co. began. 1906: Red Wing Stoneware and Minnesota Stoneware merged and became Red Wing Union Stoneware Co., and in a short time North Star went out of business and was absorbed by this company. 1936: Red Wing Union Stoneware switched its name to Red Wing Potteries, Inc. to reflect the change from making utilitarian stoneware to a line of ware for use in the home. 1953: The Red Wing Pottery Salesroom was built as a factory outlet for the Red Wing Potteries. 1967: The Red Wing Potteries closed their large factory, and the name switched to Red Wing Pottery. 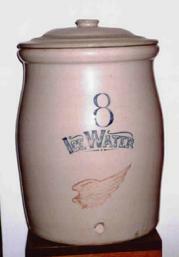 1987: Red Wing Stoneware, a new company, was formed and begins producing pottery. 1996: Red Wing Pottery begins production again under the third generation of the Gillmer family.